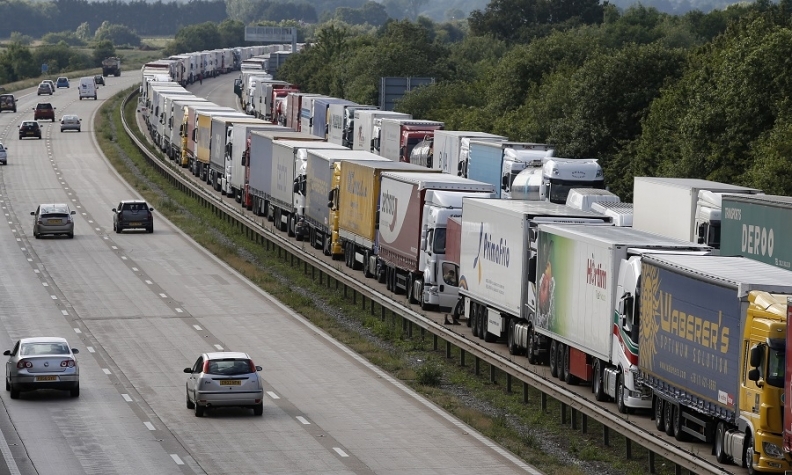 A "no-deal Brexit" could disrupt automotive supply chains, leading to lines of trucks like these on the M20 motorway which leads from London to the Channel Tunnel terminal at Ashford and the Dover ferry terminal. Audi is preparing itself for a no-deal Brexit if the UK, its second-largest European market after Germany, leaves the EU with no trade deal in place. Chief Financial Officer Alexander Seitz said the automaker was minimizing risks relating to its foreign exchange exposure, supply chain and logistics in the event that Britain leaves the EU on March 29 without a trade agreement with the EU. "We are taking all precautionary measures for a hard Brexit," he told reporters during a test drive of Audi's new e-tron full-electric SUV in Abu Dhabi. "On the finance side, our currency hedges for 2019 are already at a very high level to safeguard our proceeds and we have secured warehousing space to store parts. I doubt however that we will be able to offset all the effects." Among the considerable risks of a no-deal, automotive experts cite most of all a plunge in the pound and a breakdown in supply chains as commodities are held up for customs clearance at UK ports such as Dover that are not geared up for the massive increase in workload. Seitz’s comments come as the UK government has increased preparations for a cliff-edge Brexit, following an impasse in the British parliament. Heightening uncertainty among automakers, British Prime Minister Theresa May postponed last week’s planned vote in the House of Commons on her negotiated Withdrawal Agreement to mid-January after an internal party rebellion. This would leave the UK too little time to choose a viable alternative, whether that means a Norway-style soft Brexit preferred by some, a general election or even a second referendum. If MPs vote down May’s deal next month, the likelihood of a hard Brexit could be considerable. When asked why prepare for an event that neither side on the negotiating table claims to want, Seitz said doing anything else could jeopardize the company’s finances. “The controller’s principle of prudence applies in this case. This costs us money but were we not to do so, the risks to the company would be too high,” he said. Previously, Frank Witter, the CFO of Audi parent Volkswagen Group, had told the Wall Street Journal that his company continues to work under the assumption of a “managed Brexit” in which a deal would be struck between the EU and UK. The UK is Audi's fourth largest market after China, Germany and the U.S In the first 11 months Audi's UK vehicle sales fell 17 percent to 137,402, the company said in a statement Dec 11. China sales were up 13 percent to 597,451 during the period, German deliveries dropped 12 percent to 243,519 and U.S. volume gained half a percent to reach 200,558. Audi's global volume declined by 2.4 percent to 1.66 million. With just 100 days until Brexit, businesses and the EU are ramping up planning for the risk that the UK will leave without a divorce deal, the nightmare scenario for many companies which are now planning for an economic shock. "The risk of a 'no-deal' Brexit is rising," said the bosses of the British Chambers of Commerce, the Confederation of British Industry, the Federation of Small Businesses, the Institute of Directors and the main manufacturers’ organization EEF. The EU said it would avoid interruption of air traffic, keep financial and other trade open and respect British citizens' residency rights in the bloc if Britain left without a deal in March. But it said British trucks would lose rights to carry goods into the EU, live animals would face border checks and Britons traveling with pets would find their EU passes were no longer valid. Without a deal, the UK would trade with the European Union under World Trade Organization terms.